Wahoo Segments app is very unique, and works with many of Wahoo’s other products. The Wahoo KICKR is an amazing piece of kit, and engineered to an industrial standard. But it’s true power as a training tool becomes apparent only apparent when paired to some of the great turbo trainer apps out there – see Zwift. 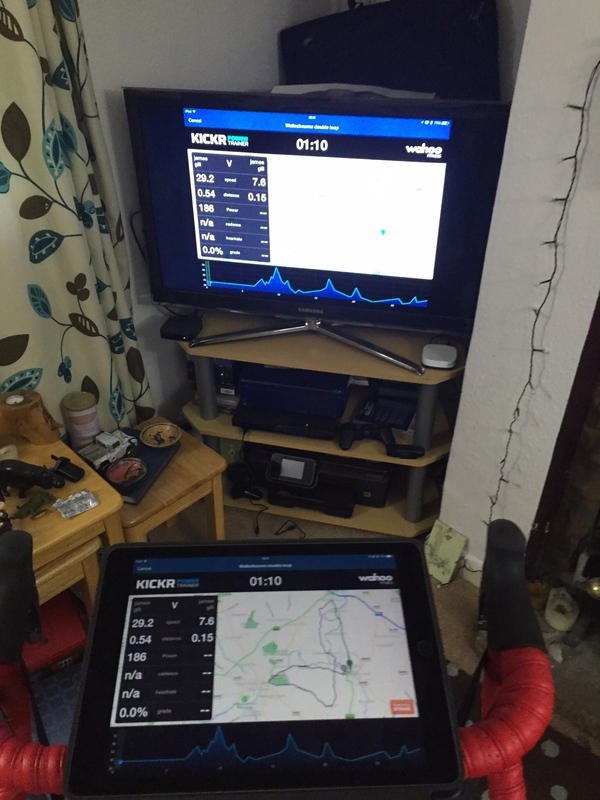 Wahoo have created the Segments app to utilise the variable resistance of the Wahoo KICKR to allow you to cycle Strava segments, and cycle against other riders pre-existing times in the comfort of your own Pain Cave/home. Currently the app is available on the App Store as one of the higher priced apps at £22.99. So like the KICKR it works with, it’s an expensive proposition, so is it worth it? The Wahoo KICKR uses both ANT+ and Bluetooth communication protocols, but as Wahoo Segments is only available on the iPad, all communications is done via Bluetooth, which might not be quite as robust as ANT+, as I’ll go into shortly. Wahoo Segments transmits information on the gradient profile of a segment to the KICKR, which will then automatically adjust the resistance to mimic the real world segment – although without wind and the rain ? Now you don’t hear proud tales of men and their turbo trainers, its thel world exploits that matter (Just tell that to someone holding all 6 jerseys on Zwift! ), but the Wahoo Segments app does give an effective, variable controlled, way to practice routes and segments from the real world. Great, you improved your leader board position on a segment, but ask yourself, was that because you improved, or that you had a good road, and a tail wind? 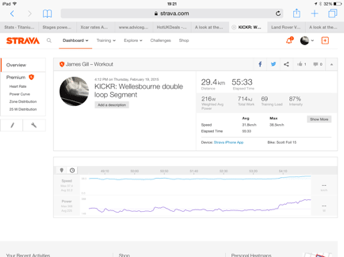 The presence of the KICKR’s in built power meter, allows you to produce data to see if you really have improved across your favourite Strava Segements, rather than just looking at times. Or just search for segments in an area via the map – this can be a good way to discover new local routes actually. Conversely its also an easier way of doing hill repeats! With the routes displayed on the map. However one problem I had here is the app seems selective about how it displays segments. For a several segments I know well, I have tried to find them on the map, but they don’t appear, even after refreshing and so have had to use the Strava segment number from the website to actually locate the stretch in the app. This seems to affect both large and small segments. During the ride there is the graph at the bottom of the screen giving an indication of the simulated elevation, and position. Your position is also shown large on the map above. As the elevation is more of an indicator, than an accurate representation, I like that Wahoo Segments also gives you a numerical read out for the gradient. In terms of racing against others times from Strava, this is done with a simple ghost bot, that you can see both on the elevation graph, or more likely pulling away from you on the map above! 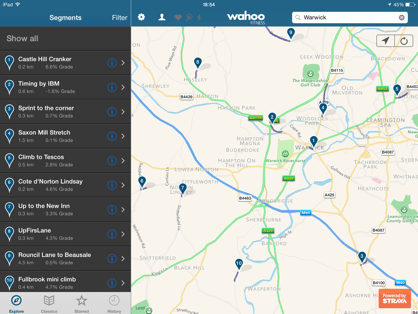 Overall, in my opinion Wahoo Segments is a great app, and when you look at some of the subscription cycling packages – Kinomap, or TrainerRoad, you can argue it’s good value for money. Especially as it allows you to train, with reasonable accuracy on the geography on routes you know. That however is not where I feel the major strength of this app is, the main strength comes from the fact you can practice training on a route you’ve never been on before, but might be shortly to race upon – such as the Velothon Wales – which was frankly far too far to drive just for a training session! The app was able to give an idea as to what the route was going to be like, and which bits to hold and which bits to attack on. 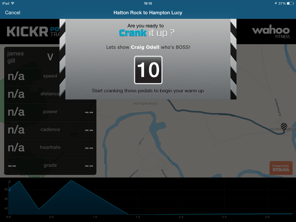 But as with many things like in the app, there are a few rough points – as you can only only run one segment at a time, and not select several segments to ride in a row/session it can make doing a longer session some what challenging, and certainly disjointed. Hopefully this is something that could be fixed very easily. Also by just having everything visible on the TV, by using AppleTV and AirPlay form the iPad, Wahoo Segments is going to make Segments a very interesting cycling program. Its just a shame that as there is no Lightning ANT+ adapter, as I think that would get a lot more people using this app, which clearly has a lot of effort poured into it.